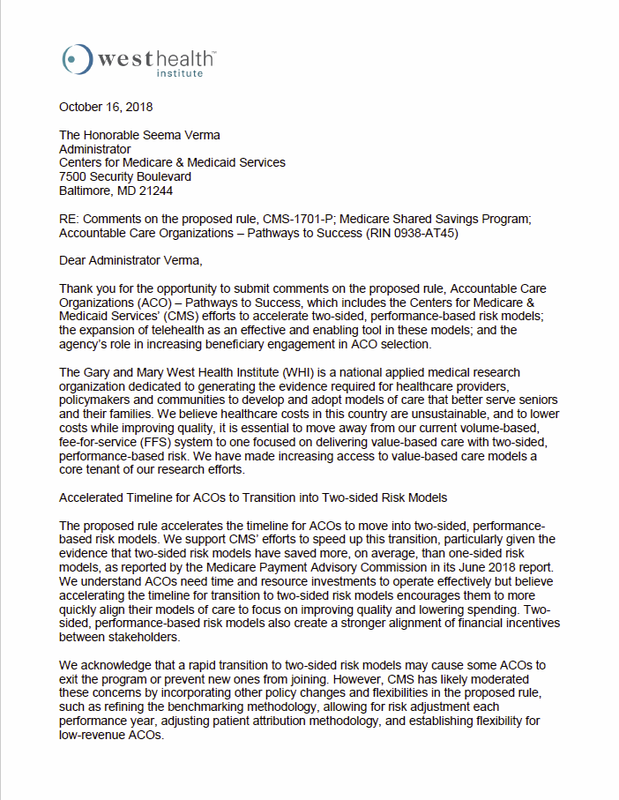 Thank you for the opportunity to submit comments on the proposed rule, Accountable Care Organizations (ACO) – Pathways to Success, which includes the Centers for Medicare & Medicaid Services’ (CMS) efforts to accelerate two-sided, performance-based risk models; the expansion of telehealth as an effective and enabling tool in these models; and the agency’s role in increasing beneficiary engagement in ACO selection. The Gary and Mary West Health Institute (WHI) is a national applied medical research organization dedicated to generating the evidence required for healthcare providers, policymakers and communities to develop and adopt models of care that better serve seniors and their families. We believe healthcare costs in this country are unsustainable, and to lower costs while improving quality, it is essential to move away from our current volume-based, fee-for-service (FFS) system to one focused on delivering value-based care with two-sided, performance-based risk. We have made increasing access to value-based care models a core tenant of our research efforts. The proposed rule accelerates the timeline for ACOs to move into two-sided, performance-based risk models. We support CMS’ efforts to speed up this transition, particularly given the evidence that two-sided risk models have saved more, on average, than one-sided risk models, as reported by the Medicare Payment Advisory Commission in its June 2018 report. We understand ACOs need time and resource investments to operate effectively but believe accelerating the timeline for transition to two-sided risk models encourages them to more quickly align their models of care to focus on improving quality and lowering spending. Two-sided, performance-based risk models also create a stronger alignment of financial incentives between stakeholders. We acknowledge that a rapid transition to two-sided risk models may cause some ACOs to exit the program or prevent new ones from joining. However, CMS has likely moderated these concerns by incorporating other policy changes and flexibilities in the proposed rule, such as refining the benchmarking methodology, allowing for risk adjustment each performance year, adjusting patient attribution methodology, and establishing flexibility for low-revenue ACOs. The Bipartisan Budget Act of 2018 (BBA) expands the use of telehealth waivers in Next Generation ACOs and ACOs in Track 2, Track 3, and other two-sided, performance-based risk models. Policies in the proposed rule fulfill these provisions by allowing use of telehealth waivers in two-sided risk ACOs that use prospective beneficiary assignment. Through our research, we have demonstrated that telehealth is an efficient and effective tool for improving patient access to care in value-based care models. Telehealth allows care to be delivered to patients in their homes—often a more appropriate setting than hospitals or other inpatient facilities for seriously ill individuals. ACOs with two-sided risk have aligned incentives to maximize the benefits of telehealth and use it efficiently to provide essential care and improved quality, while decreasing costs. The proposed rule also puts forth regulations to implement the voluntary alignment provisions included in the BBA. Although we support this attribution method as a potential means for increasing beneficiary engagement in value-based care, we encourage CMS to adopt consumer protections during this process. Specifically, CMS should implement safeguards to prevent ACOs from encouraging or dissuading a beneficiary’s selection of a “primary clinician” based on the patient’s risk profile. Additionally, as beneficiaries actively select their primary clinician, CMS should inform them—in an easy-to-understand and accessible manner—that Medicare allows them to seek care from any participating clinician, inside or outside an ACO. Thank you for the opportunity to provide our perspectives on the proposed rule. WHI strongly encourages CMS to move towards adoption of these promising two-sided risk models and fully supports the expansion of telehealth services as part of the movement to value-based payment. Additionally, we are encouraged by action to increase beneficiary engagement in ACOs, but caution that CMS will need to implement safeguards to ensure beneficiaries are aware their coverage allows them to see any Medicare-participating clinician. If you have any questions regarding these comments or wish to discuss these matters in more detail, please contact me at 858-412-8677 or slyford@westhealth.org.